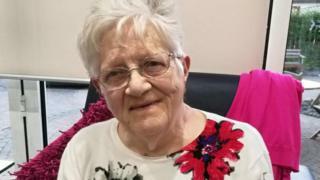 A County Antrim woman said she is "devastated" after a care home discharged her mother 12 hours after she fell in the unit. Fiona O'Neill said Rose Court Home in Ballymena contacted her while her 89-year-old mother, Margaret, was being treated in hospital. "There was absolutely no inquiry about my mum's welfare, at all," she said. A spokesperson for Runwood homes said it was no longer able to offer Mrs O'Neill the nursing care she required. Mrs O'Neill said her mother was found lying on a floor in the home at about 01:30 BST on Sunday and was taken to Antrim Area Hospital. Her family was informed at about 03:00 BST. She said her mother was in a lot of pain, adding: "It was really awful." "She apparently had been unwell and didn't want to go to bed so she was sitting on a chair and when they found her she was sitting on the floor." Mrs O'Neill said that Runwood Homes told her via a telephone call at lunchtime on Monday that her mother had been discharged from the nursing unit to Antrim Area hospital. She said her mother was no longer a resident at the unit as Rose Court had now been transformed into a full residential home without a nursing unit. Mrs O'Neill said: "We left her in the care of Rose Court, she had an accident, and now they have said 'remove her stuff, she's nothing more to do with our home, she is now the responsibility of the trust," she said. "There was absolutely no inquiry about my mum's welfare, at all. "She is not just a statistic... I don't think she was very compassionately cared for by Rose Court by that call today, or what has happened in the last number of weeks." Rose Court is run by Runwood Care Homes, a company based in England. In a statement to the BBC, the company said Rose Court can no longer admit any residents who require nursing care as it is now re-registered as a residential unit. Runwood Homes said it "decided last month to repurpose a 31-bed nursing unit at Rose Court, Ballymena, as a residential unit in line with local community need". It explained that this was due to a "UK-wide shortage of nursing staff". "While we cannot go into the specifics of care for individual residents, we can say this resident has been made several offers of alternative accommodation which she has turned down because she wishes to remain at Rose Court," a spokesperson said. "However, going forward we are not permitted to admit any residents who require nursing care as the nursing unit is now re-registered as a residential unit." The BBC understands a number of nurses at Rose Court resigned last month and that that forced the re-designation of the home to a residential unit due to safety reasons. The families of 26 residents were given two weeks to find alternative accommodation. Places were found for 25 of the residents but not for Mrs O'Neill, who was left the only resident in the unit. Runwood Care Homes also owns Dunmurry Manor care home which has been embroiled in controversy after an investigation found an "horrific catalogue of inhuman and degrading treatment".